RANGOON — More than 6,000 candidates from 92 parties battling it out for nearly 1,200 constituencies. Public polling is non-existent; the two biggest parties are riven with internal divisions. In this context, speculating about the outcome of Burma’s looming general election is either an act of bravery or lunacy, but there is one prediction that political observers can make with a reasonable degree of certainty. Aung Min and Soe Thane will be members of the next Union Parliament. Both men are close confidantes of President Thein Sein, and both men are serving ministers in his cabinet—Aung Min as the steward of the government’s nationwide ceasefire negotiations, and Soe Thane as the architect of its economic reforms. Both are contesting seats as independent candidates in the Upper House for Karenni State. Aung Min is seeking election in Karenni-7, encompassing Shadaw Township, and Soe Thane is running for Karenni-9, which takes in half of Bawlakhe Township. Burma’s township-based electoral system has wild variations in voter numbers between constituencies in both houses of the Union Parliament. The industrial outer Rangoon seat of Hlaing Tharyar, for example, has nearly half a million residents above the age of 18. The Pegu Division seat that Aung Min successfully contested in 2010 has about 175,000 people of voting age, while the Tenasserim Division seat Soe Thane won five years ago has around 95,000. On Nov. 8, the pair will be competing for the two smallest constituencies in the least populous region of the country. According to the 2014 census, Aung Min’s constituency had fewer than 4,000 eligible voters last year, while Soe Thane’s had fewer than 3,000. They will be competing against a fractious opposition, with five ethnic parties fielding candidates in the state, alongside the National League for Democracy (NLD) and the National Unity Party. Gen. Saw Lwin, secretary of the Kayan New Land Party (KNLP) armed group, told The Irrawaddy that unlike other border areas of the country, Karenni State’s ethnic political parties had negligible support among locals and were facing financial difficulties. Aung Min faces four opponents and Soe Thane faces three. Even with a 100 percent turnout in their electorates, both could conceivably win with less than 1,000 votes under the country’s first-past-the-post electoral system. Both men have been accused by ethnic opposition parties of buttering up their constituencies ahead of the vote. Saw Daniel, a candidate for the Kayah Unity and Democracy Party (KUDP), told The Irrawaddy that Soe Thane has been sponsoring local football matches and distributing SkyNet satellite dishes to locals in the constituency for the last 3-4 months. All Nationals Democracy Party Kayah State (ANDP) chairman Phoe Yal claimed that Aung Min had gifted money to village elders, and distributed rice along with branded campaign hats and umbrellas to Shadaw locals. If the odds weren’t already far enough in their favor, both men are competing against candidates from the ruling Union Solidarity and Development Party (USDP) who are likely to run dead—because for the last month, both Aung Min and Soe Thane have been members of the USDP’s central executive committee. In the 2010 elections, every single state and union constituency in Karenni State was won by the USDP, largely on the back of advanced voting that observers roundly criticized as a means of coercing a victory for the junta-backed party. Five years later, the USDP faces an uphill battle against the NLD, which sat out the 2010 poll while party leader Aung San Suu Kyi was under house arrest. The prospect of losing government on the back of an NLD landslide appears to have been enough for Aung Min and Soe Thane to seek election in Karenni State, where a sparse population, remote location and divided opposition would work to the benefit of candidates with significant financial resources. Both men were blocked from contesting in Karenni State under the USDP banner by the party’s central committee in July, in the strongest sign to that point of a rift between the executive of Thein Sein and Union Parliament Speaker Shwe Mann. The USDP leadership, then dominated by Shwe Mann and his allies, had also blocked the candidacy of up to 100 members of the military, apparently seeking to distance the party from its junta roots and reorient it around Shwe Mann’s presidential ambitions. The rift culminated on Aug. 12 when Thein Sein’s faction moved against Shwe Mann, locking USDP lawmakers in the party’s Naypyidaw headquarters overnight and coercing a vote to remove the speaker as party chairman while he was kept under guard at home. Hours earlier, Thein Sein issued a statement announcing the resignation of a number of ministers, eight of whom subsequently took positions in the reconstituted USDP leadership, and at least six of whom are now contesting the election. Now that Thein Sein loyalists have reasserted control over the party, it is unlikely that the party will lend support to the USDP candidates selected to run by the previous leadership who are now competing against Aung Min and Soe Thane. President’s Office Minister Soe Thane in 2012. Attempts to clarify the USDP’s position on the candidacies of Aung Min and Soe Thane were unsuccessful. Tint Zaw, a fellow member of the party’s central committee, said he was unable to comment and on Monday referred questions to USDP acting chairman Htay Oo, who was installed after Shwe Mann’s ouster. When reached by phone, Htay Oo asked The Irrawaddy to call back that evening and did not answer subsequent phone calls. Whatever questions have been raised about Aung Min and Soe Thane’s candidacies, they are both acting within the law. Sein Win, chairman of the Karenni State office of the Union Election Commission (UEC), told The Irrawaddy that there are no legal restrictions on party officials contesting elections as independents, nor are their limits on the number of candidates from the same party that can contest the same seat. Though Soe Thane’s rivals claim his sponsorship of football matches has exceeded the official campaign expenditure cap of 10 million kyats (US$7,845), the spending limit only took effect with the commencement of the official campaign period on Tuesday. Some legal experts have claimed that Aung Min and Soe Thane are acting in violation of Burma’s 2008 Constitution. Section 232 of the controversial charter prohibits Union ministers from participating in party activities from the date of their appointment, a provision that would appear to block the two men from taking positions on the USDP central committee. However, Chapter 14 of the Constitution also allows for transitory provisions, drafted before constitutional government was introduced, to have binding effect on the interpretation of its clauses. The Union Cabinet Law, promulgated by the former military junta just one month before the 2010 elections, gives ministers the right to begin campaigning once authorized by the UEC. This permission was granted on July 8, according to an announcement in state-run media. Political commentator Sithu Aung Myint, who has written extensively on the Union Cabinet Law for the Myanmar Times and other local media outlets, believes a parliamentary battle to amend the law may have precipitated the move against Shwe Mann. A bill put forward in the Union Parliament in June made a one-word change to the law. 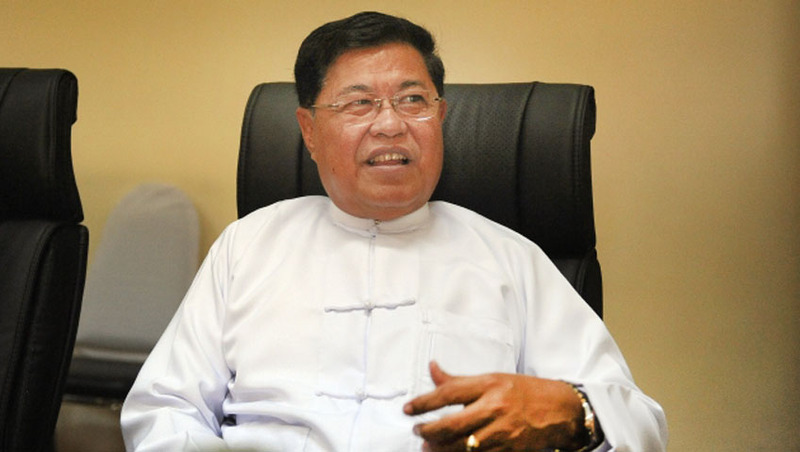 Seemingly cosmetic, Sithu Aung Myint told The Irrawaddy that the removal of the word “parties” would have forced incumbent ministers to contest the election as independents, giving an advantage to Shwe Mann’s cabal at a time when the present government has clear aspirations to regain executive office next year. The bill was still before Parliament on the night of the Aug. 12 party putsch. It appears that some ministers hedged their bets by resigning on the same day, in case Shwe Mann managed to pass the amended legislation during Parliament’s final session. Though Shwe Mann supporters and the NLD managed to delay a vote on an impeachment bill—apparently expedited in an attempt to either lay the groundwork for Shwe Mann’s removal from Parliament or as a stern warning—no further progress was made on the Union Cabinet Law. For Aung Min and Soe Thane, in the end there was no need to resign. As head of the Myanmar Peace Center, Aung Min is now in position to push through the final stages of a nationwide ceasefire agreement, which Thein Sein has proposed be signed on Sept. 29. For the president, who has staked much of his legacy on building the framework for national peace, the signing of the ceasefire before the election is crucial. This week, Suu Kyi travels to Karenni State to galvanize support for the NLD, one of her first stops on the official campaign trail. Should she raise questions about the ministers’ candidacies or their campaigning activities, she will have to choose her words wisely. The UEC and the Ministry of Information have laid down onerous campaign restrictions, including the vetting of speeches, a requirement for the pre-approval of campaign events, and a blanket ban on “defamation” of the government in print materials and advertisements. What has once again been made clear in Karenni State is that meticulous preparations have been made for any possible contingency that could wrest control from Burma’s entrenched military and ex-junta elites before they are ready. It was apparent in the gerrymander that gifts the military a quarter of parliamentary seats, it was apparent in the thwarted ambitions of the Shwe Mann faction, and it is apparent again in the candidacies of Soe Thane and Aung Min. To borrow from junta parlance, the notion of “discipline-flourishing democracy” flourishes as ever. As one foreign Thailand-based journalist remarked on Tuesday, in recent weeks there has been a subtle shift in coverage of the November elections. What was until recently trumpeted as the country’s first “free and fair” poll, November is now increasingly seen as the chance for Burma’s “most credible” election, as reporters and observers begin to manage their expectations. A statement published by state-run media on Aug. 18, ostensibly clarifying the Shwe Mann purge, said the government was committed to free and fair elections and would unconditionally acknowledge the results. But as the government’s laws and interpretation of the Constitution shows, the definition of “free and fair” is highly malleable. Top Photo - ( JPaing / The Irrawaddy) Aung Min at a meeting of government and ethnic armed group ceasefire negotiators in March.